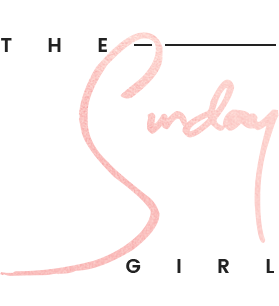 A few days ago I was lucky enough to pop along to Topshop's beauty showcase and let me tell you there is lots in store for the coming months. Topshop beauty will not only unveil a new foundation, concealer and primer line but there is also watercolour blushes and believe it or not a freckle pencil in the pipeline too! 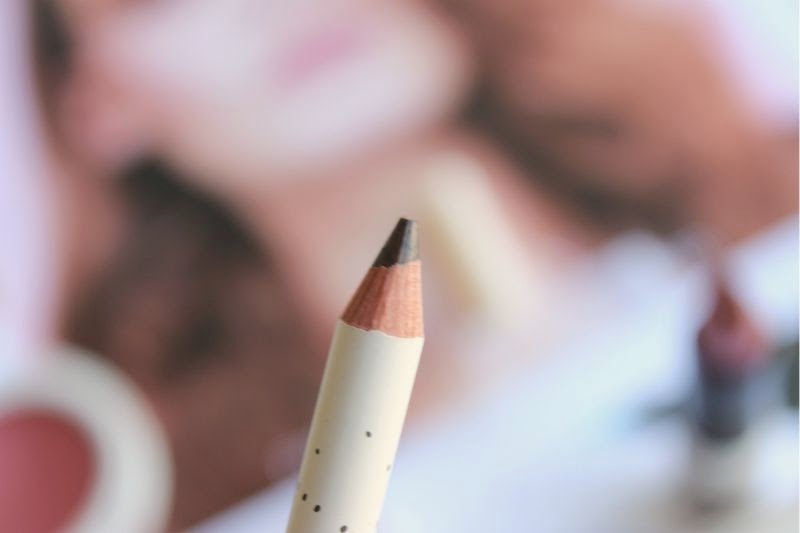 For me the most intriguing product has to be the Topshop Freckle Pencil (£5), on first inspection you would be forgiven for assuming it is nothing more than a typical khol pencil but up close you can actually see it is a medley of black and brown. The tiny point of the pencil has an almost leopard print effect, you really have to look closely at in person to see this. 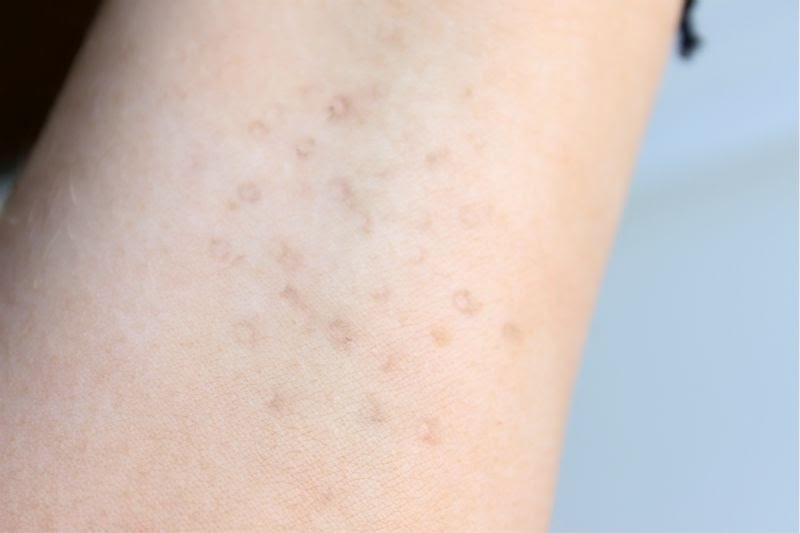 The idea is that combining both black and brown when dabbed on to the skin it will create an non-uniform splattering of dots which should mimic real freckles. I have tonnes of moles all over my body but don't freckle in the sun, freckles have always been one of those things I have always envied, they are just so pretty. 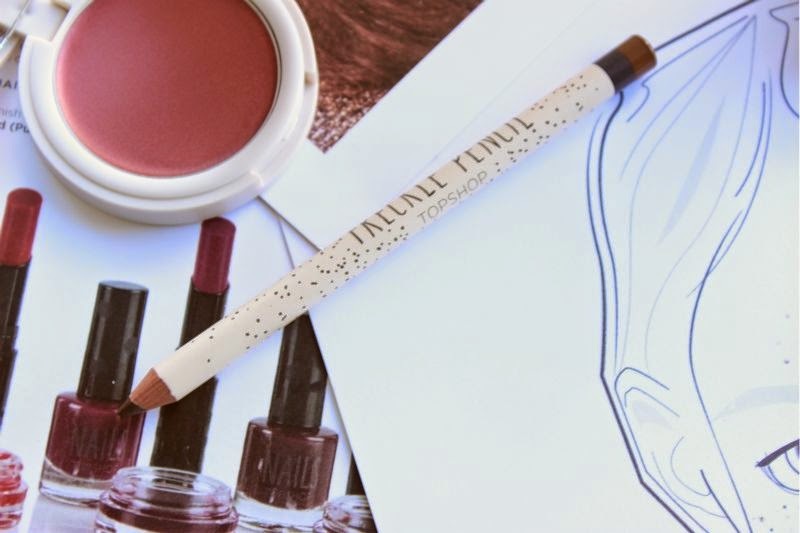 The texture of the pencil is firm but slightly waxy so it won't slip or slide throughout the day but it is soft enough to dot on the skin. 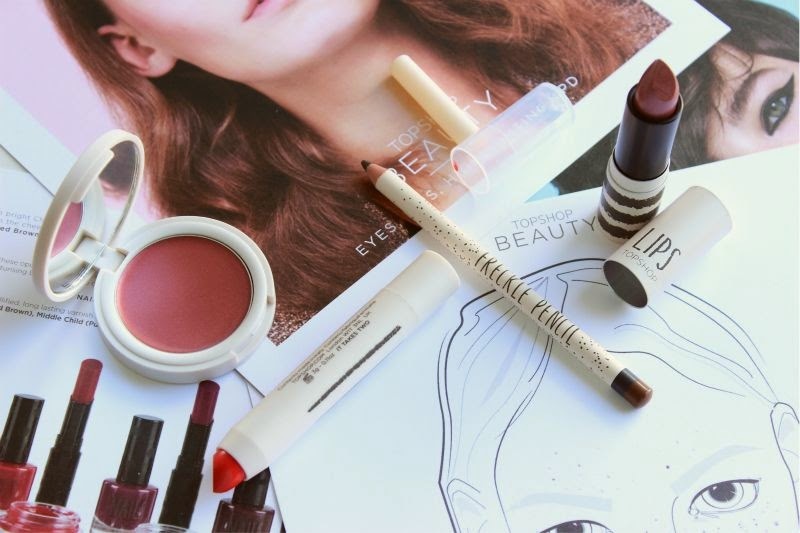 I should mention that it is not as pigmented as your typical eye pencil (yes this is more of an face product but I can't think of what else to compare it to) so I don't think it could be used elsewhere on the face. Truthfully I can't quite get the pencil to achieve natural looking freckles, perhaps practise is perfect? Metallics will be huge once more this Autumn/Winter and again in luxe, jewel tones and for such seasons Topshop will be launching four new metallic lipsticks and two metallic cream blushes. 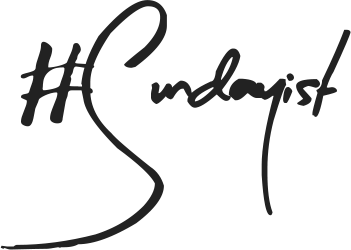 For me the main reason I raid the Topshop beauty stands are for the blushes and lipsticks, they are well priced and beautifully formulated. Perfect. 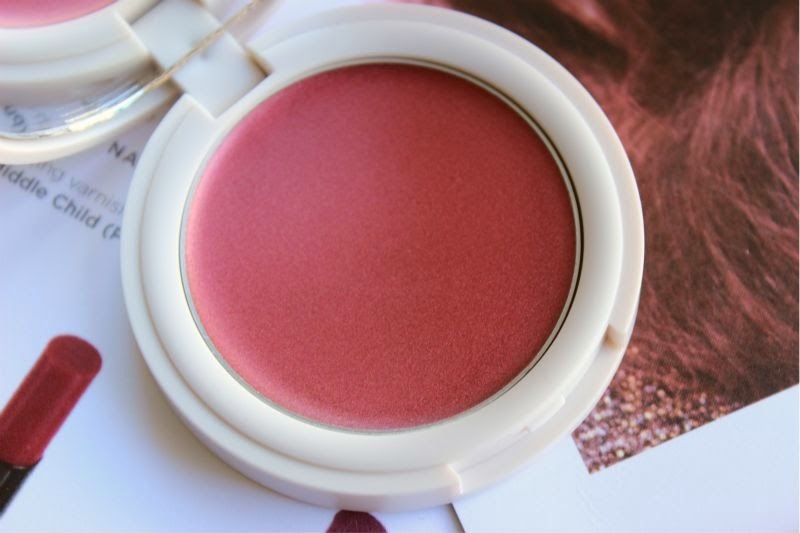 I have one of the new cream blush shades Aorta, which is a deep metallic burgundy. It reminds me slightly of MAC Cranberry but slightly more pink in tone. Oddly I don't like the shade on my cheeks but find it really pretty on the eyes - to each their own. 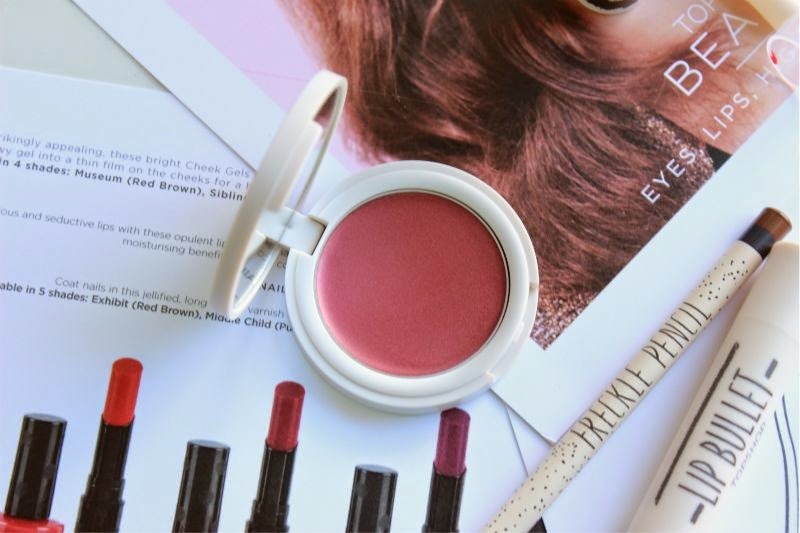 That is the great thing about Topshop's Cream Blushes they are soft enough to blend out on the cheeks yet once set they were for quite some time and can double up as a lip or eye colour. Not bad for £7. As mentioned there will be four new metallic lipsticks (£8 each) to choose from which are surprisingly wearable, I have the shade Armour which is not worlds apart from the above blush. 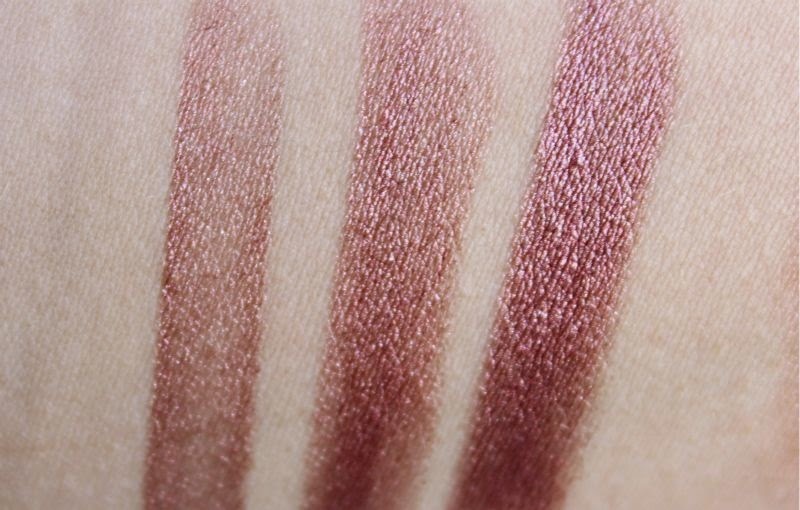 Armour is a purple toned, rose gold. Sounds odd doesn't it? Yet it works. I will state that this is one of those shades that will make teeth appear more yellow than they actually are. 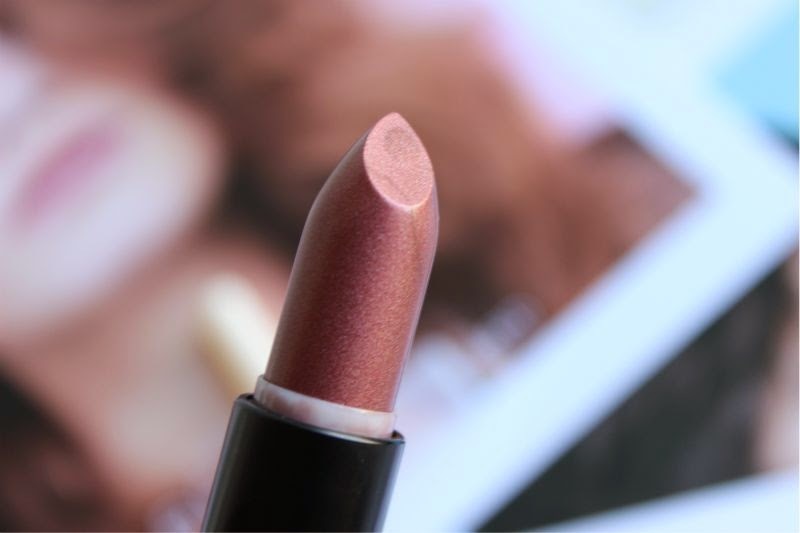 Despite being metallic this has a super soft formula that glides on to the lips with ease, moisturises and isn't prone to bleeding or feathering. 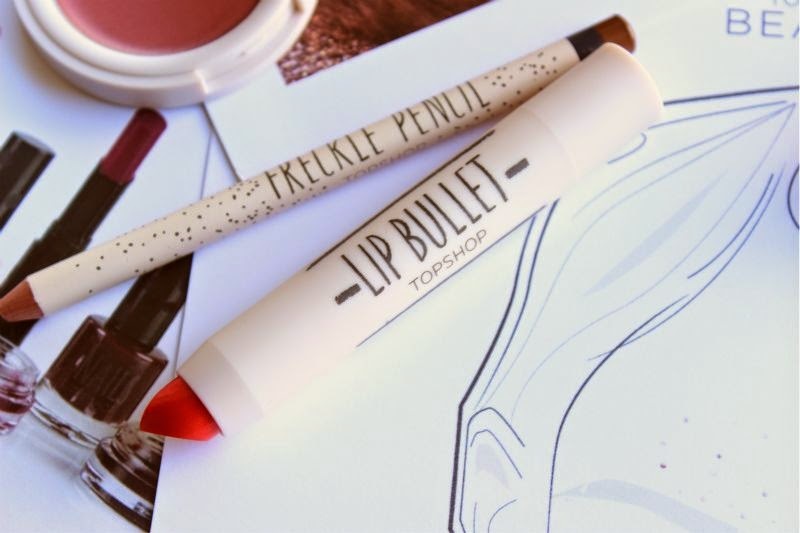 Last but not least you can expect lots of new Topshop Lip Bullet (£8) shades including an all matte range. I apologise that I am unsure just how many new shades will be in-store but there was easily at least 6 new offerings to choose from. 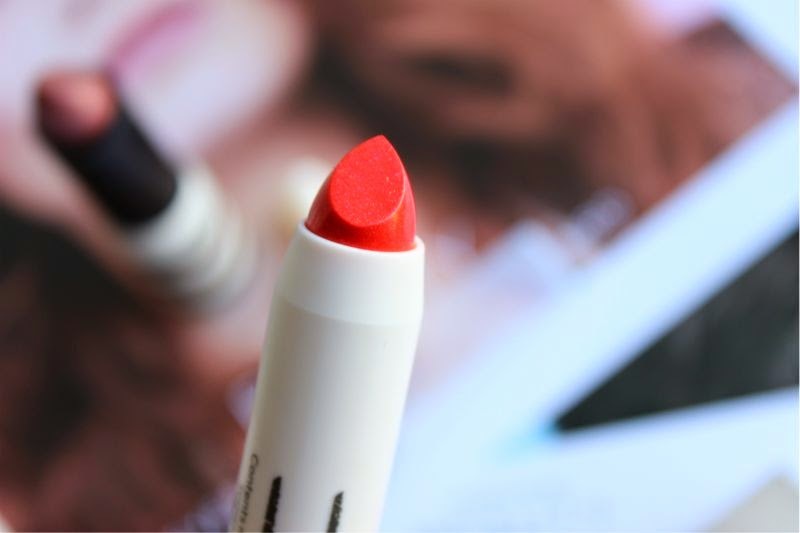 I have the bright red orange that is It Takes Two, a glossy and easy to shade to wear. 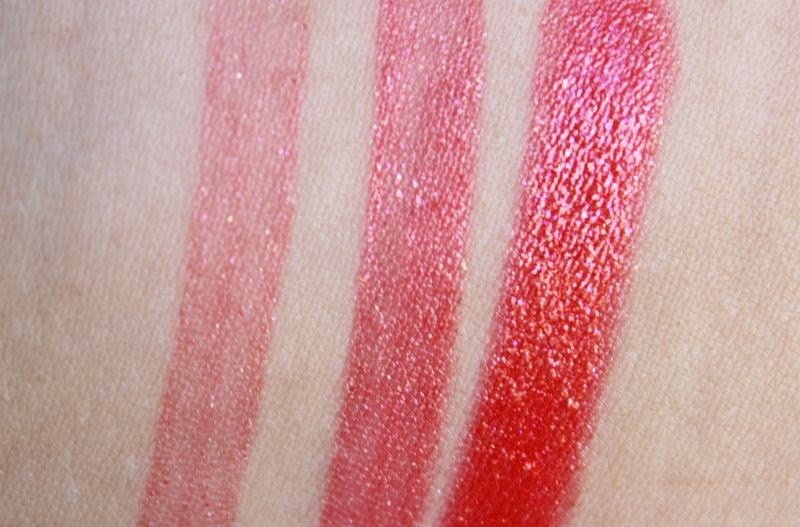 Although not matte it is a good alternative (not to mention cheaper) to NARS Red Square, well if you can overlook the glitter aspect. I'm really excited for the mattes to launch along with the new foundation and watercolour blushes (think Josie Maran coconut gelee blushes and you will have the general idea). 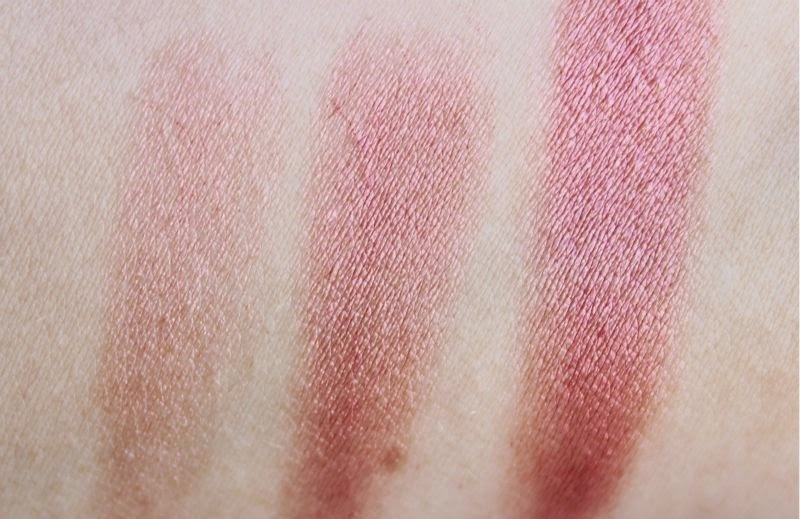 Ohh, the blush is so pretty! 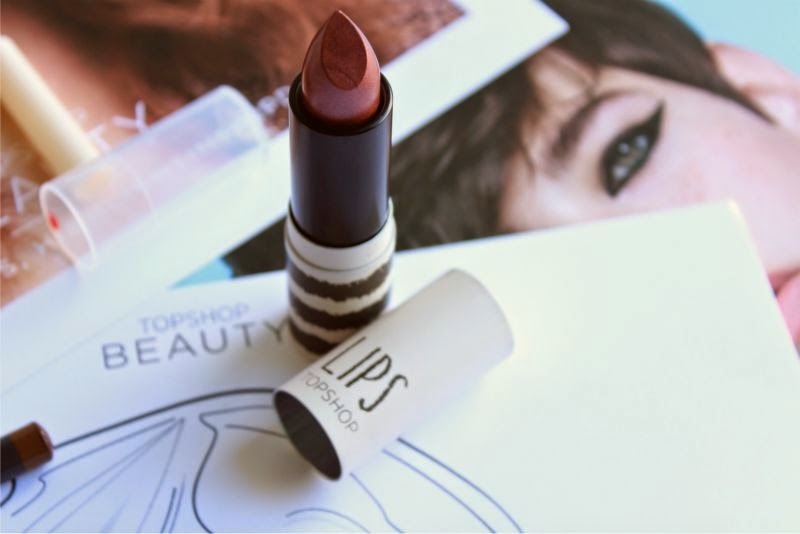 It takes two looks like such a nice shade!